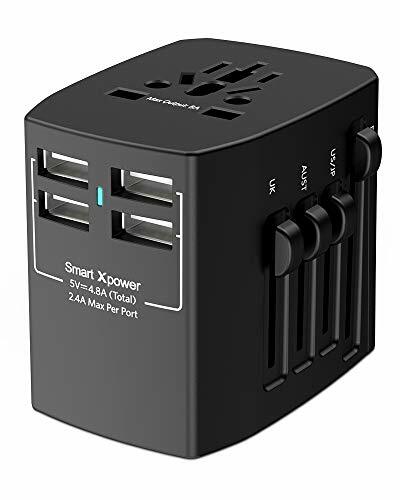 ✔WORLDWIDE POWER ADAPTER: Universal multi-function Travel Adapter fits more than 150 countries with US/EU/AU/UK plugs. This adapter is perfect for your worldwide traveling. ✔SMART RAPID CHARGING: 4 ports 4.8A USB output to charge your devices simultaneously with high speed. Max AC power 880W at 110V, 1840W at 230V. The adapter can not convert voltage. ✔SMART SAFETY PROTECTION: Built with Xcentz's smart xPower technology, protects your device from over-current, over load, short circuit and high-temperature. 8A Overload AC Input, Dual Fuse and ROHS, CE and FC Certified to ensure safety use. ✔UNIVERSAL COMPATIBILITY: Compatible with all USB ports devices like iPhone, Samsung Galaxy, XiaoMi, HUAWEI, Motorola, Tablets, Digital Cameras, MP3 Player and so on. Small power devices under the maximum power of the adapter would be supported to use. Please do not use high power appliances, it may damage your appliances. ✔WHAT YOU GET: 1 * Xcentz Universal Adapter, User Manual, 18-month warranty and friendly customer service.